Observing sessions begin a lot earlier this time of year. As you step after dinner in the cool night air, the familiar square of Pegasus greets you high in the eastern sky. The top of the square called Markab, a hot spectral class B9 star some 205 times the luminosity of our Sun. At 140 light years from us, Markab measures three times the mass of the Sun and only takes a day and a half to spin on its axis compared to our Sun’s 25 day spin. Both Pegasus and Andromeda seem to share a common star named Alpheratz. Although it is officially referred as alpha Andromeda, this B5 star located 97 light years away also forms part of the great square. One of the best examples of a spiral galaxy is the Deer Lick. Also known as NGC 7331, the Deer Lick should be on your list to view and photograph. At 48 million light years away, this spiral is located to four farther and fainter galaxies (NGC 7335, 7336, 7337 and 7340). With magnitudes around 15th and fainter, dark skies and large telescopes are required to view these with your eye. Located a few degrees from NGC 7331 is the challenging cluster of galaxies called Stephan’s Quintet. At an estimated distance of 300 million light years, this group of distant galaxies range in brightness from magnitude 13.9 to 16.7. They are gravitationally bound and will eventually merge to firm a huge elliptical galaxy. Of course we must cross over to the view the jewel of the night, the Andromeda Galaxy. 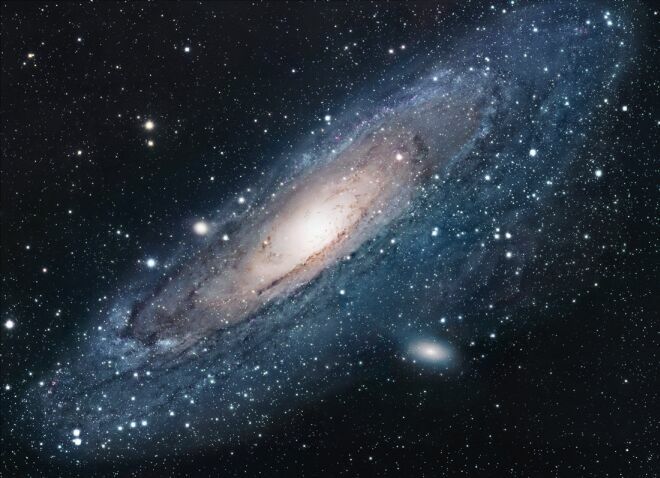 Catalogued as M31 or NGC 224, the Andromeda Galaxy is an astounding object with the naked eye from dark sites, using binoculars or a telescope. The 2.5 million light year galaxy is flanked by its two satellite galaxies more commonly referred as M32 and M110. M31 measures three degrees or six full moons in width. With moderate to large telescopes, many globular clusters can be located in this distant galaxy. Four billion years from now, the Andromeda and Milky Way galaxies will merge to form a new galaxy called Milkomeda. Another favourite target to view and image is the face-on galaxy M33 located in Triangulum. It lies about 300 thousand light years farther than Andromeda and glows at magnitude 5.7. Embedded in its spiral are red energetic areas of star formation. Recent observations and research have led to the discovery of thousands of exoplanets orbiting distant stars. This all began back in 1995 with 51 Pegasi. Located 50.9 light years away, it was the first exoplanet discovered orbiting a Sun like star. You can easily see this star with the naked eye on a clear night. It is located to the right of the Great Square. Now find Upsilon Andromeda with a distance of 44 light years from us. Named Titawin, this magnitude 4.0, F8 yellow-orange star is home to four exoplanets. It is that time of the year when most locations turn their clock back an hour as Daylight Saving Time ends at 2 a.m. on November 5. When doing so remember your conversion to Universal Time is also adjusted. The planet Jupiter is now moving to the morning sky and on Nov 17 forms a lovely trio with Venus and the 1% lit moon. Jupiter continues to climb higher throughout the month as Venus sink towards the horizon. Saturn is the lonely naked eye planet seen after sunset, moving closer to the western horizon. Comet C/2017 O1 ASAS-SN is still on its northern route through Cassiopeia. Meanwhile Comet 24P/Schaumasse is expected to brighten mid month and should be a great binocular target as it passes first through the constellation Leo and then Virgo. Two meteor showers are slated for this month. First the North Taurids is a weak shower with only five meteors per hour as it peaks on the night of the 11/12. This year’s Leonids peaks in the night of Nov 17/18 with about 15 meteors per hour. These low rates should continue until the year 2030 when we might see over 100 per hour. The Leonids are often bright meteors with a high percentage of persistent trains. This month’s full Beaver moon occurs on November 4 with the new moon (lunation 1174) on the 18th.